Give an elegant makeover to your restrooms with an exclusive range of shower, bathroom and toilet cubicle partitions from Greenlam Sturdo. Placed among the leading manufacturers of toilet cubicle partition in India, we offer a remarkable collection of divider panels, doors and connecting panels (end and mid) assorted in four magnificent collections - Classique, Vibrance, Kids and Designer, each carrying a unique appeal. Greenlam Sturdo offers a wide variety of bathroom and shower cubicles in India to meet all your specific needs. Our cubicles are designed to offer high aesthetic appeal with no compromise on quality. We provide quality assurance on all our range of restroom cubicles along with innovation, durability and style. Greenlam Sturdo is a leading bathroom cubicles manufacturer in India, providing high quality modular cubicles to suit different needs. We have a wide variety of restroom cubicles for kids. Not only that, we also provide cubicles to suit the needs of differently-abled people. These restroom cubicles are easy to maintain and clean. 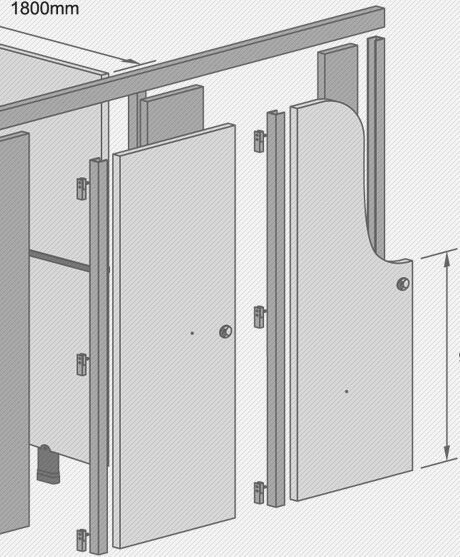 All our restroom cubicles are manufactured in accordance with IS 2046. The restroom cubicles are available in various sizes, shapes and colour hues. They are built with nylon polyamide, stainless steel, and aluminum hardware fitting. If you wish to benefit from attributes such as unmatched aesthetic beauty and customization, easy installation, top-notch functionality and enduring quality, step into the world of Greenlam Sturdo toilet cubicle partitions in India. Talk to us today to discuss your requirement with pros and get shower cubicle panel prices. Simply call +91-11-4279-1399 or write to us at info@greenlam.com. You can also send a message and we will take it from there.